Tomatoes are fun to grow, but they are susceptible to many infections. Tomato diseases are caused by bacteria, fungi, and viruses. They spread through the soil, water supply, air, infected tools, animals, and gardeners. Fortunately most are usually not fatal. The key is to identify a disease early so you can treat it before it overtakes the plant and then manage symptoms successfully. Take these preemptive steps to handling diseases. Anticipate. 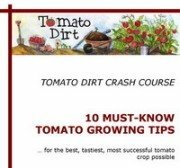 Find out about tomato diseases common to your area. Talk with local nursery staff and ask for information from representatives at your region’s extension service. If tomatoes in your area are prone to a certain disease, plant resistant varieties. Monitor. Check your plants each day for symptoms. Identify. Study symptoms and treat diseases quickly so your plants can recover and flourish. Diseases affect four areas on the plant: leaves, stems, the crown and fruit. Look for these symptoms to indicate possible infection. Note symptoms. Diagnose your tomato plant’s problem by comparing its symptoms with descriptions of specific diseases. Treat according to recommendation for the specific disease. See list of diseases below to help with your diagnosis! Before planting, add a good amount of compost or organic matter to the home garden to improve the soil. Extra nutrients and aeration grow stronger plants which can resist infection. Keep tomatoes on a regular watering schedule to help them stay healthy and strong. Avoid over-watering which can lead to consistently wet conditions – the perfect environment for many bacteria, fungi, and viruses to multiply. To make and set up a solarizing tarp, first till the selected garden area. Dig a low trench around its circumference. Soak the area thoroughly with a sprinkler. Cover the area with a sheet of clear plastic 1-4 mm thick, allowing plastic edges to extend into perimeter trench. Back fill the trench to secure plastic. Leave the plastic in place for 6-8 weeks, making sure to remove debris and excess water that pools on top so that the sun’s rays can penetrate the tarp. The sun heats to soil to destroy bacteria and other organisms. Solarizing infected soil can make it usable for the next season’s crop even though it means the selected area cannot be cultivated during the peak of the current summer.